Our final winter forecast will be released at 9:00 p.m. EDT on November 21. As we get closer to this date we will fine tune our forecast, but at this point we are expecting above normal snowfall for much of the Great Lakes region and southern Quebec. We also expect a snowy winter across Atlantic Canada, but not to the extent of what we saw during 2013-14 and 2014-15. 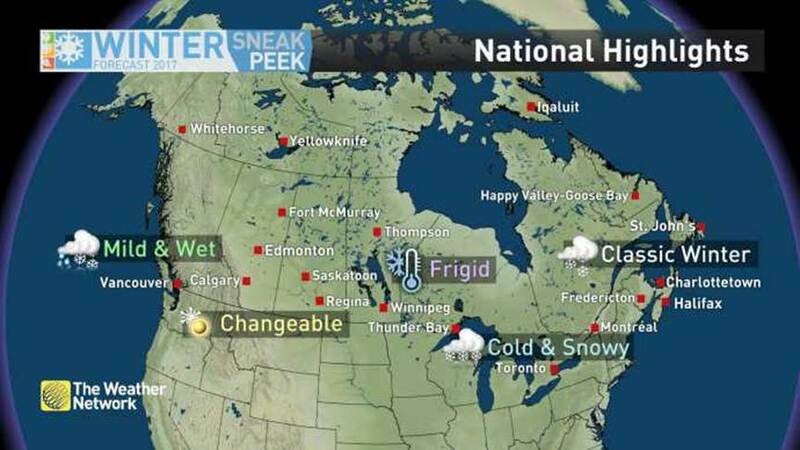 Near normal snowfall is expected in the Rockies and across the Canadian Prairies. Below normal snowfall is expected again along the South Coast of BC. An unanswered question as of yet is whether snow levels will be low enough in the coastal mountains to allow for a strong ski season despite the lack of snow at lower elevations. Confidence is actually higher in the pattern for mid and late winter than it is for early winter. From the Great Lakes to the Maritimes where above normal temperatures have dominated the fall pattern, there are conflicting signals as to when the pattern will change. At this point we think that winter will get off to a slower or inconsistent start with the colder pattern more likely to lock into place later in the winter (similar to what we saw in 2014-15). However, it is possible that the pattern will change more quickly (as it did in 2013). The timing of this pattern change should become more clear before we finalize our winter forecast for release on November 21. In addition, as we fine tune the forecast we will need to determine whether the focus of the coldest weather will be from Alberta to the Great Lakes, or further to the east from Manitoba to the Maritimes. Confidence in a cold winter is highest from Manitoba to the Great Lakes with the greatest amount of uncertainty for the Maritimes and especially for Alberta. What can the weather this summer fall tell us about the upcoming winter? Unfortunately, one cannot make generalizations about the next season simply based on the current season. History shows us that for every mild fall that was followed by a mild winter, there was also a mild fall that was followed by a cold winter. However, the hot summer and warm fall in the Great Lakes region have left us with lake water temperatures that are well above what we typically see this time of year. While this did not have a significant influence on our temperature forecast for winter, it does impact our snowfall forecast for the traditional snow belt regions. When arctic air does arrive, these regions areas should receive above normal amounts of lake effect snow. What are the keys to the Winter 2016-17 Forecast? 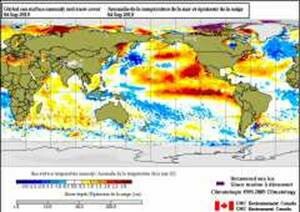 One of the key considerations in developing our seasonal forecasts are ocean water temperature patterns around the world. 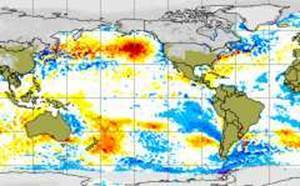 One region that is typically of particular interest is near the equator in the Pacific Ocean. When ocean water temperatures in this region are significantly warmer or colder than normal, this can become the dominant driver of the weather patterns across North America. This time last year, ocean water temperatures were considerably higher than normal as we progressed towards one of the strongest El Niño events on record (shown on the first map below). 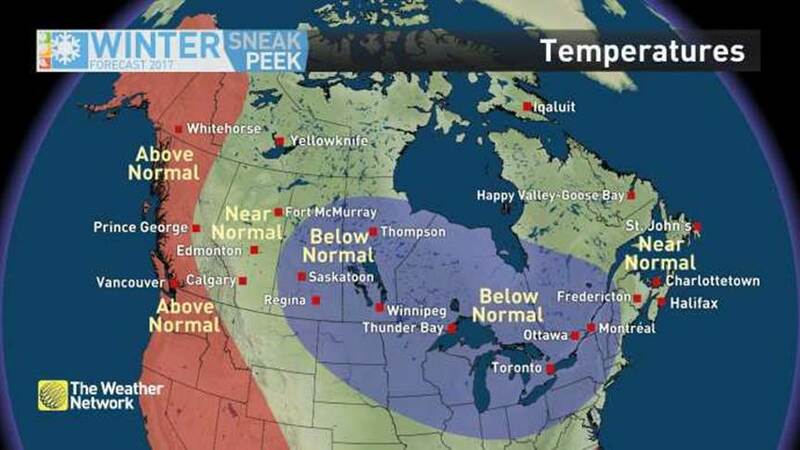 This was a key to the mild winter last year for most of Canada. However, the pattern this year is rather different as ocean water temperatures in this region are now running cooler than normal (shown on the second map below). The current pattern has the look of a weak La Niña event, but it is unlikely to meet the criteria needed to be classified as such. While weak La Niña and even neutral conditions do impact global weather patterns, this pattern is not as dominant in its influence as is a strong El Niño or a strong La Niña event. 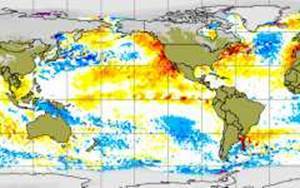 Therefore, temperature patterns in other regions (such as the North Pacific and North Atlantic) will be more influential during the upcoming winter season. 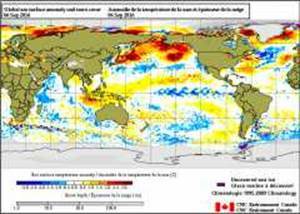 Two features that stand out this fall are the large region of very warm water (relative to normal) west of British Columbia, and the warmer than normal water in the Atlantic Ocean east of Atlantic Canada and the U.S. East Coast. This bears some resemblance to the patterns during the falls of 2013 and 2014. The maps below are from late fall in 2013 (first map below) and 2014 (second map below).